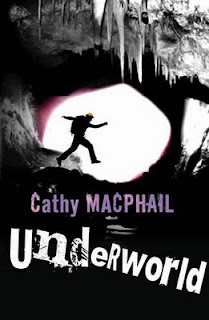 "A school trip goes disastrously wrong when a visit to local caves turns into something far more sinister. Five school children find themselves trapped beneath the ground. Their best chance of escape is to stay together. Then a member of the group disappears, and their hopes of leaving start to fade. Does one of the remaining four know more than they are letting on, or is there something evil lurking in the caves? The five children find themselves in a struggle for dominance as well as survival ." Information from Goodreads. I really dislike giving bad book reviews because someone has put their heart and soul into their work and here I come to criticise it, but if I could have given a good review I honestly would have, but oh how I hated this book. What too harsh? Maybe, but let me explain why it holds such a dramatic impression. Now the idea behind the plot is pretty interesting. A group of teenagers are taken down into a cave on a school trip when the entrance to the cave 'caves' in and they are trapped. They then have to find a way out, without the help of their guide and that's when things really start to go wrong. A legend of a worm is also unnecessarily added the plot which we then have to deal with. But for me the thing that really annoyed me about the book was the over use of the word Zonk! I now hate this word beyond belief. I'd start to enjoy the story then zonk, zonking, zonked or any other version of that word would be mentioned and my ears would ring and my blood would boil. Too extreme? No! Yes I fully understand that teenagers generally overuse words, and yes it is rather irritating but I can be irritated by that on my own, I don't need you, Cathy MacPhail, to remind me every two sentences. Plus what makes it even worse is that the term zonk is very outdated. I've always been a firm believer that certain things should be omitted from books, like the mention of TV shows for example, as they are too time specific, and speech is one of those things. Now I don't mean speech as in old english against 'new' english, I refer to speech as in slang. Slang is so quickly changed that within a year or less it can be outdated. But the word zonk is even worse. According to my Mum (the best source of knowledge) the word zonk was common when she was young and she's 50. Because of this super annoying word I cannot fully review this book as I cannot get past 'zonk' so if you care to brave it I'll leave you to make up your own mind about this book. But don't say that you weren't warned. Now I've only got to find something to do with this book as it's not going anywhere near my book shelf.